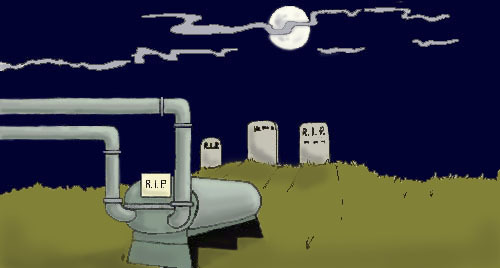 Is your absorption chiller ready for the graveyard? Would you like to help your absorption chiller perform better and last longer while saving money at the same time? Often overlooked by HVAC service personnel is the fact that complicated absorption systems have a chemical aspect as well as a mechanical one. The efficient operation and useful life of these chillers depends significantly upon proper inhibitor balance, reducing harmful contaminants and the chemical management of its Lithium Bromide charge. The corrosion problems of absorbers can be identified using modern analytical techniques. Then, by adding the proper chemicals, the Lithium Bromide can be adjusted to improve the system's performance and increase its longevity. Richard S. Levine and LBD ASSOCIATES can help you manage your absorption chiller's chemistry. In the early 1970's, Mr. Levine modified the Lithium Bromide chemistry in 60 absorption chillers at the University of Illinois that were performing very poorly. These chillers had a life expectancy of roughly 20 years. A June 16, 1999 article published in the "Daily Illini" (the school's newspaper), stated that "more than 83 percent of the steam chillers are at least 30 years old and are expected to fail within the next five years". This clearly demonstrates the power of corrosion control and Mr. Levine's skill since the 20 year projected lifespan of the chillers had been surpassed by more than 10 years. Since 1974, Mr. Levine, as President of Industrial Corrosion Management, Inc. (ICM) and LBD ASSOCIATES has continued to rescue and improve hundreds of absorption chillers throughout the United States and the world. His expertise is now available to manufacturers, equipment owners, maintenance personnel, and service mechanics. property of LBD ASSOCIATES, LLC. No form of reproduction is permitted.